It returns nearly every autumn/winter season: Velvet. This material with it's smooth touch and elegant shimmer is just the right thing when it gets colder and returns in deep rich berry tones this season. Velvet used to be a material associated with wealth and nobility, although nowadays it's available for all of us, it didn't loose the air of luxery. Originally it was made from silk and cotton, more recently as well from polyester. It' s very easy to combine with almost any other materials. I wouldn't mix too many different velvet pieces in one outfit maybe, but there are no boundaries for experiments. My shopping advice would be to go for a velvet kimono or velvet shoes to add a touch of glamour to your looks. 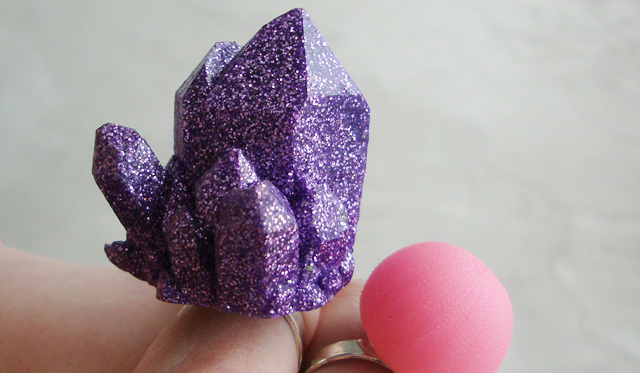 I hope I'll soon have my velvet dream come true. Is velvet one of your favourites too this autumn/winter? The moment I've been waiting for is finally here: The new Joanna Pybus collection is out. It's a lot about contrasts: Thick faux fur clashes with translucent vinyl, monochrome colours are accented by vibrant neon. Joanna sticks to faux fur, which has become an integral part of her designs, but shows us another approach to this material. The distinctive Joanna Pybus eye print patterns return as well, mixed with other interesting patterns and prints. Hi Joanna, please tell us a little bit more about your new collection and what inspired you. The collection has been approached from a post apocalyptic view point, with strong references to dilapidated architecture, corrupted digital medias and hazard warning signs. My research included all manner of things- right from movies like The Hunger Games and Bladerunner to Super Mario Bros underworld levels. (www.joannapybus.tumblr.com has just some of the images I used during my researching/moodboarding). It was also important for me to embody a sense of power and strength in the collection, and this has been represented in the stone marble fabrics (used in my personal fav of the collection, the 'Column Suit') and the strong silhouettes – I would like to think that this strength is then translated into the wearers confidence. Your new collection is darker than your earlier work, is this a new tendency for the future of your designs? Yes it is quite dark! I really enjoyed working to this kind of tone in this collection- it was really great to be working with a different feeling in mind- although I think my previous work had some dark or creepy undertones to it but was represented in a giant candy coating! I'm not sure if its necessarily the future of my designs, I guess we'll just have to wait and see what comes of my research in the next collection- but I definitely loved working with a darker tone. What kind of a woman do you imagine to wear your fashion? I imagine she is confident, laid back and funny – I think she rolls out of bed and just wants to throw something on that will make her feel good. Which famous person would you love to dress and why? Maybe someone like Grimes- she's super cute and I imagine she's a lot of fun. I think she'd have fun wearing my stuff. Also maybe Brooke Candy (coincidentally, also in a Grimes vid! )- she has a great confidence and attitude, and such a powerful look – I imagine she could be really fun to dress. If your fashion would be a meal, what would it be? 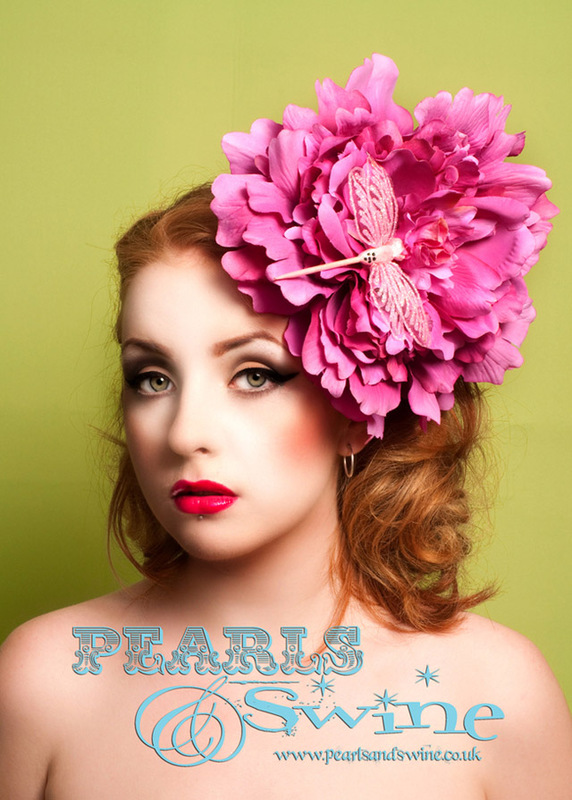 Visit Joanna Pybus' page or follow her on Facebook. Melons and pineapples are on the menu for today. 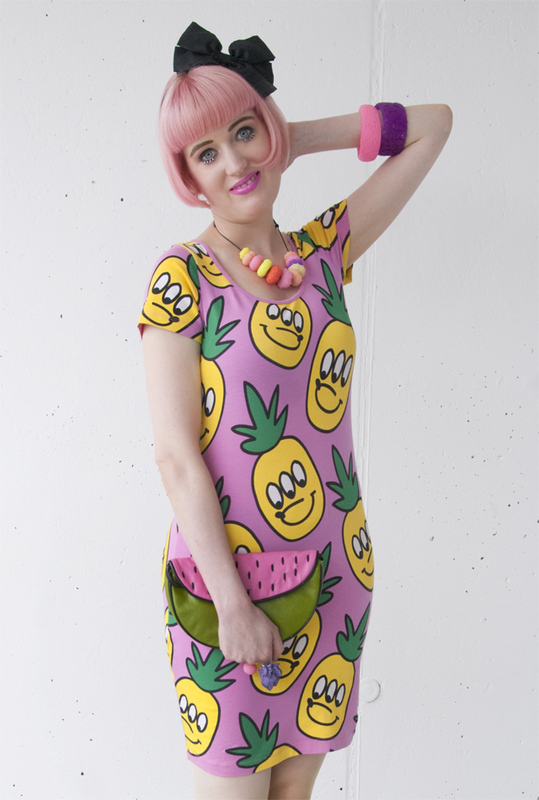 Yes, I am a fruity comic babe, no doubt! 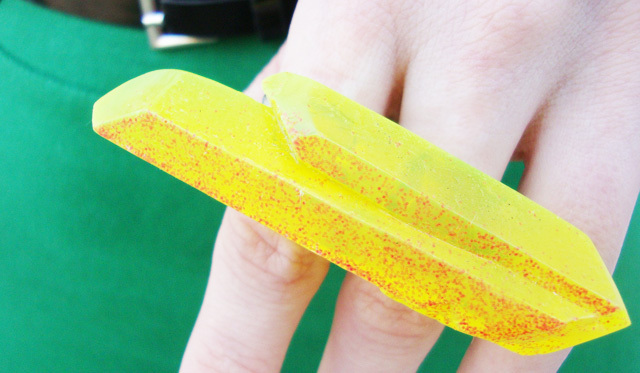 Confetti nails and a lot of hand/arm candy makes my day. Didn't you know that pineapples have three eyes? Pastel haired fruity girl having fun. 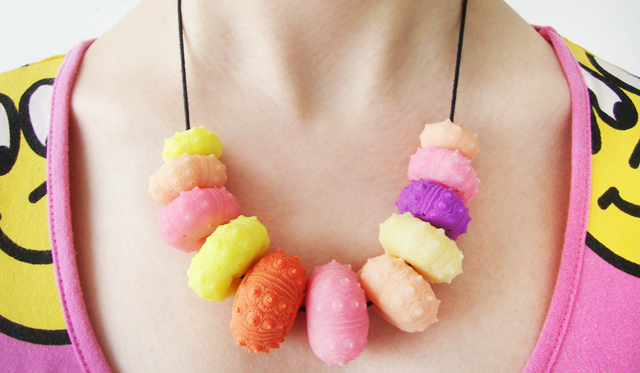 I think this sea urchin beads are like a beautiful symphony for the eyes. 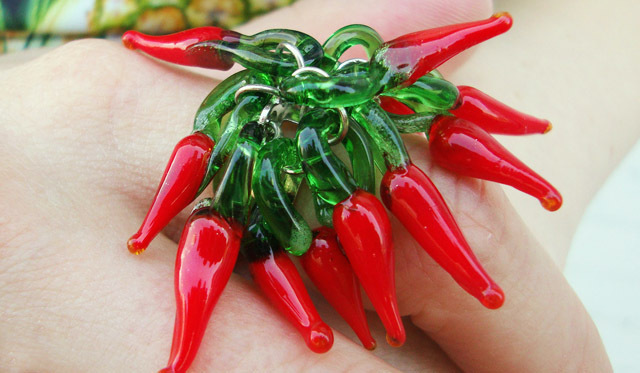 Bangle crush with this resin beauties. Their vibrancy is amazing. 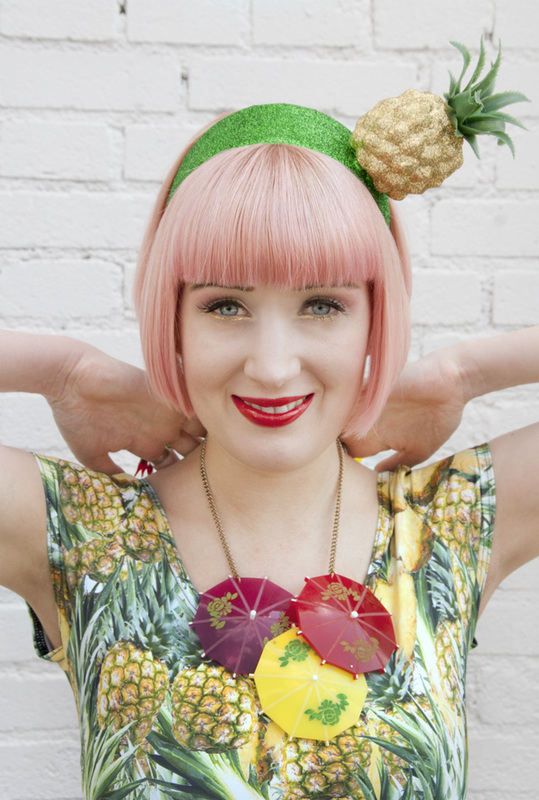 The pineapples on my dress couldn't take all of their three eyes form my jewellery today. All this adorable accessories came to me all the way from Australia and I can't stop loving them. Pink, Purple, yellow and orange all mixed up is just a great combination and I think the accessories add a lot of extra fun to the outfit. 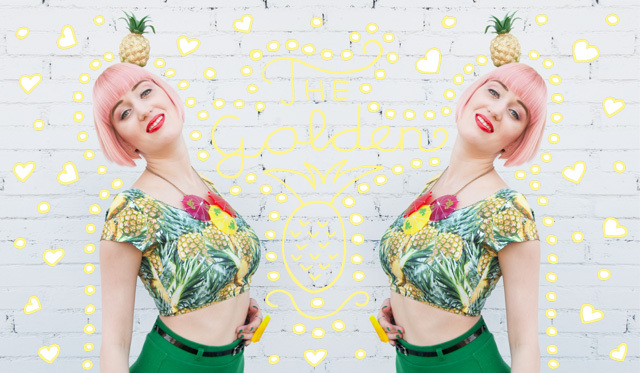 I am obsessed with pineapple prints as you might have noticed already if you follow me on Instagram. 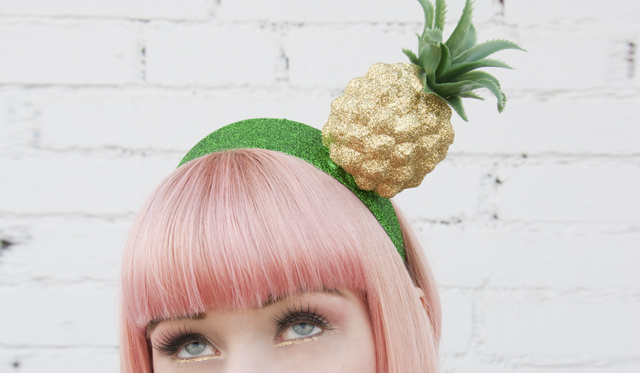 This is the first pineapple look for this season, but definitely not the last. 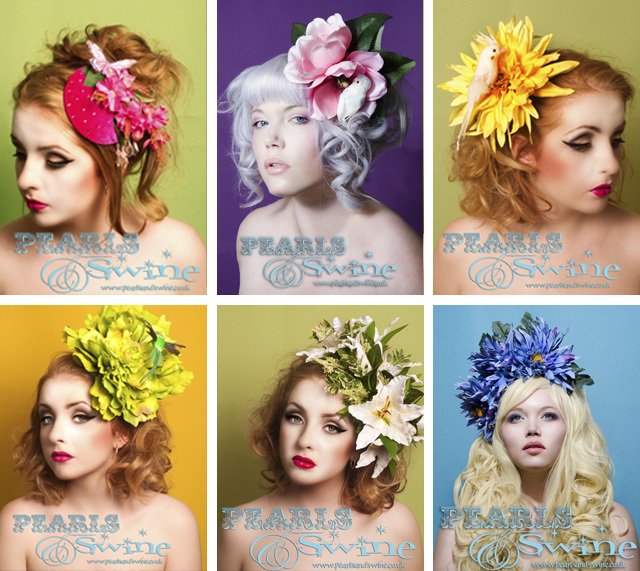 A few other fruity discoveries are still waiting to be styled. For now I am very pleased how this quirky 90s inspired dress looks combined with all the resin jewellery. It's a very girly look and perfect for casual weekends full of fun indeed. This outfit would be my choice to wear to a concert from Japanese singer Kyary Pamyu Pamyu or to make funny Purikura pictures with my friends. Unfortunately both of this things are not possible in my city, but at least I am prepared and meanwhile I wear it wherever I go. 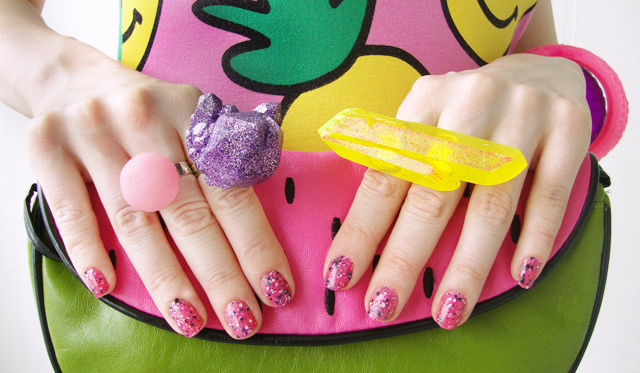 What do you think about this fruity look and how do you like my new jewellery? Thanks a lot to Serena Kuhl for this amazing jewellery. Let me introduce a brand new label from London: Dazzle & Jolt. 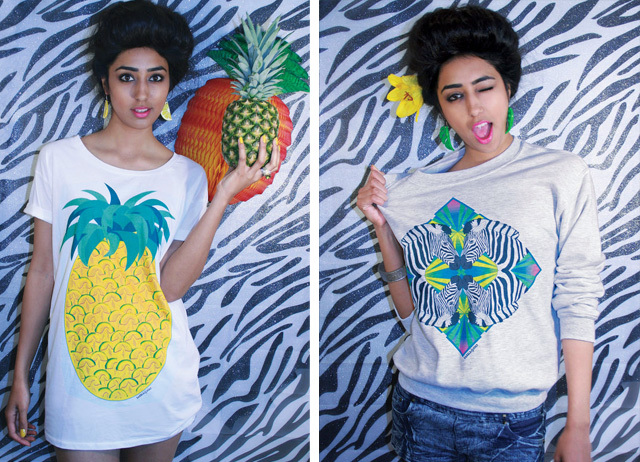 This year the exciting brand launched it's first collection called "Geometric Jungle". 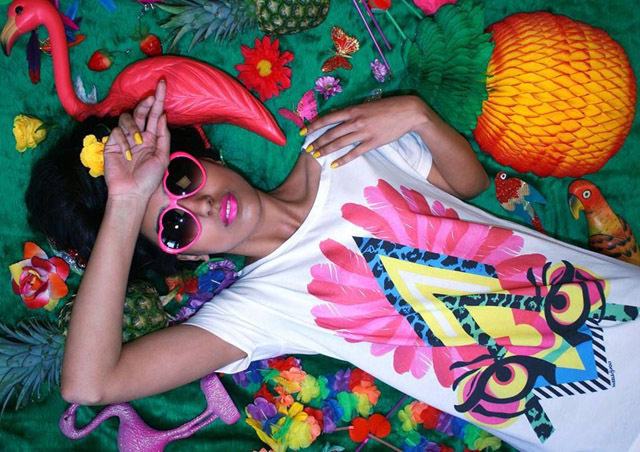 Happy jungle prints in all the colours of the rainbow makes the collection perfect to brighten up your outfits. 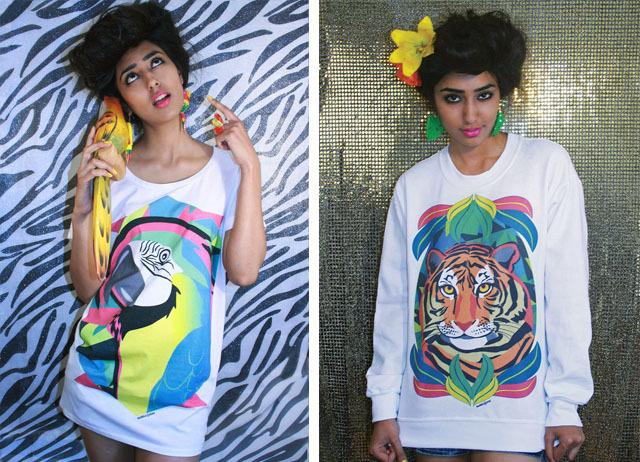 Fruits, flowers and exotic animals such as toucans, parrots and tigers have their big appearance on Dazzle & Jolt's tees. 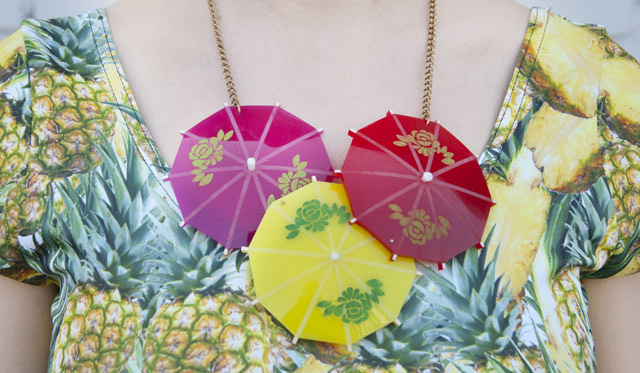 Every piece is a bold statement of fun and joy. You can wear them as the splash of colour to an otherwise plain outfit or let them be part of a rainbow look form head to toe. 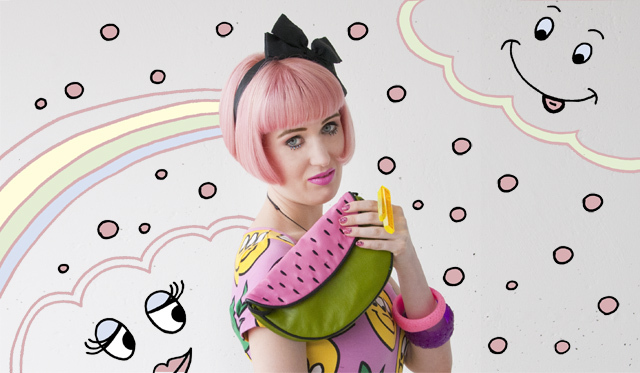 Dazzle & Jolt was founded by the two friends Jessica Holt and Zara Saleem. Their mission is to colour the world. All their prints are limited edition, so get your hands on their tees, crop tees and sweaters as long as you can. The tees are made from 100% organic cotton and printed in the UK. I love the graphic quality of the illustrated prints and can't decide for a favourite. It seems like Dazzle & Jolt just has all the things I love most on their tees (maybe expect cats and melons), so I am torn between pineapple, flamingo and parrot. Why not just get them all and make the streets of the city less monochrome? Visit Dazzle & Jolt here or join their Facebook page. Which one is your favourite Dazzle & Jolt piece?